Leaarn How Moisture Eliminators and Axial Fans supply fresh air to marine engines and maintain essential, uniform conditions to maximize horsepower, fuel efficiency and longevity. Viking Yachts, Westport, Palmer Johnson, Ocean Alexander, Grand Banks and many other production and custom boat builders routinely install Delta T components as standard items. Powerful Delta T axial fans flow high volumes of air at the same time keeping sound levels low. Moisture eliminators literally dry the airflow to the engine room, keeping the space free from corrosive salt spray that would otherwise corrode critical components. Moisture eliminators work their magic by unceremoniously slamming water droplets and wet air against a special wall. The sudden stop causes liquid to tumble out of suspension. Then unwanted moisture collects in a gutter and drains overboard. Don't misunderstand. These systems are not like big window fans, but instead are sophisticated ventilation systems. At main engine start up, the system cycles into automatic mode. Fan speed automatically responds to variations in ambient (air temperature and humidity) and operating conditions (engine temperature). Airflow either speeds up or slows down depending on engine room demand. for example, when ambient temperature rises, exhaust fans speed up, extracting heat from the engine room. On engine shutdown, fans switch to quiet mode, cooling the engine room, then shutting off at a specified temperature. Manual mode, activated from a color touchscreen display at the helm, allows you to independently change fan speed and the directional airflow into or out of the engine room. Delta T also builds fire dampers. In the unlikely event that an engine room fire is detected, Lloyds of London-approved dampers instantaneously slam shut and an environmentally-friendly extinguishing agent is discharged. The system concentrates the fire-fighting agent where it can do its best work and prevents additional oxygen from infiltrating and feeding the fire. So how does this work? It's as simple as the sea is salt. Automatic fan systems manage temperature and ventilation. When ambient engine room temperature reaches 105 degree F fans spin at low speed. Lower speeds not only make less noise but also decrease current draw by roughly 75-percent lower, saving energy. So should the temperature continue to rise to 113 degrees Fahrenheit the fans cycle up to full speed. As the engine room cools, the fans switch back to low speed and then turn off. In manual mode, the operator can set the fan speed to either low or high, or off. 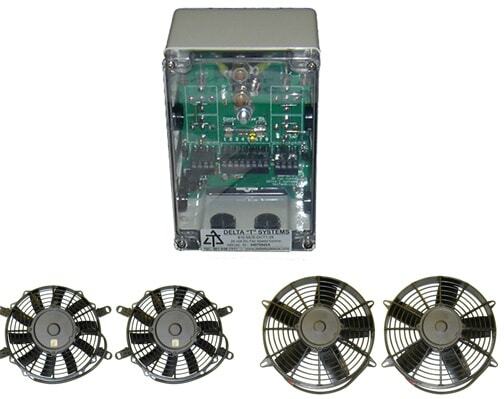 Delta T Systems controller can manage up to four 11-inch or six 9-inch fans. The 9 inch fan spins 10 blades and pushes a high air flow volume of 737 Cubic Feet per Minute (the nine inch fan can push or pull). Both 12- and 24-volt DC versions are available. With 5 blades, the bigger diameter 11-inch fan, flows 1, 424 CFM. Maintenance free, the economical 600-DCT1-24 DC Fan Control System from Delta T Systems has a suggested retail price of $750. The powerful nine-inch and 11-inch DC Marine Axial Fans start at $200.